In InLoox PM Web App, you can configure finely structured and freely definable permissions. So, you can clearly define responsibilities and make sure that only authorized users gain access to sensitive data. You can set permissions in the InLoox PM options. InLoox PM Web App is delivered without permissions being set. So, every user can see and change all permissions. This might be a security risk. 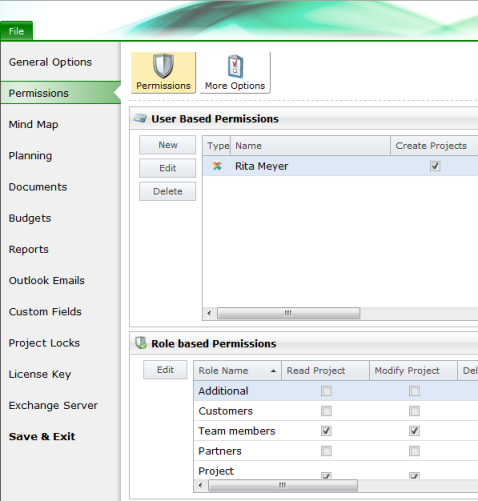 In InLoox PM Web App, you can select role-based and user-based permissions. Click Permissions in the navigation pane. On the right side, you see the Permissions section. InLoox PM Web App does not support Windows groups at this time. Microsoft Exchange Server or InLoox PM contacts are required. Persons are identified by their Windows or InLoox Security Identifier, or SID, and the Windows X400 address, or Exchange address. Persons with the same X400 address have the same role-based permissions in InLoox PM Web App. If this is not what you want, please deactivate the role-based permissions entirely by removing all permissions for all roles. Working with InLoox PM Web App you can assign the permissions for both contacts InLoox PM and Outlook as the web client uses the same data base as InLoox PM for Outlook. InLoox PM Web App supports also both authentication types Windows and InLoox PM. InLoox now! displays only InLoox PM contacts and provides only InLoox PM authentication. In the User Permissions dialog box click User. In the Address Book dialog box choose the needed contact and click OK.
For more information on how to create an InLoox PM contact, see Add a contact. In InLoox PM Web App, in the User Permissions dialog box, in the Login area will be automatically chosen between Windows or InLoox PM Authentication depending on what authentication has the chosen contact. InLoox now! provides only one option - the InLoox PM authentication. Select the permissions for the respective user from the permissions list on the right side. In the Options dialog box, in the Role based Permissions section, click Edit to change the selected role based permission. Select the permissions for the role from the Permissions list, in the Additional dialog box. Use the Select all or Remove all (to remove all permissions) commands. Define and Edit User Permissions in InLoox PM 7 Web App • Copyright 1999-2019 © InLoox GmbH. Reservados todos los derechos.